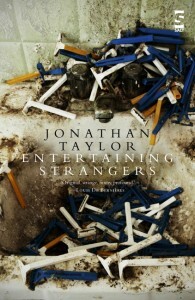 Entertaining Strangers is the first novel by Jonathan Taylor, Senior Lecturer in Creative Writing at De Montfort University, UK. Taylor has also published a memoir, and writes short stories and poetry. Entertaining Strangers is narrated by Jules, a young homeless woman who is welcomed into the home of Edwin Prince, an odd, yet eccentric and intelligent man obsessed with ants. A seemingly (at first) passive character in this novel, Jules innocently and lovingly accepts Edwin's hospitality, and goes on to narrate and recount Edwin's relationships with his landlord, relatives, and ex-wife, all while sharing breakfasts together that consist of nothing but vermouth. Jules becomes fast friends with Edwin, and even attempts to help him collect ants for his ant farm, and rekindle (or smooth out) a few of his relationships. While Jules stays with Edwin, she repeatedly experiences dream-like sequences (or memories) that involve fire and painful tragedy from seventy-five years ago. By the novel's end, it is evident that Jules, Edwin, and the other characters are all pieces in a giant puzzle - a puzzle not without a slew of symphonic classical music pieces, and, of course, ants. Entertaining Strangers is probably one of the more creative and original novels I've ever read. It's definitely an intellectual's book: one clever and gigantic allegory full of surprises, and an abundance of intriguing information about ants. Those who read Entertaining Strangers should definitely approach it with patience, as it could be easy to overlook some of this novel's depth otherwise. Taylor also mixes poetry into this book courtesy of Edwin's character, which only heightens the richness of his character. As an American, I found this book wholly fascinating even without taking the plot into consideration. I was completely arrested while reading about the lives of these quirky characters and their British lifestyles. Who drinks vermouth straight out of the bottle, anyway? Taylor's smart and eccentric writing style reminds me a bit of Neil Gaiman and a (very light) Chuck Palahniuk. Taylor's inspiration for this novel as told in the Afterword is also most compelling and unique. What an original foundation on which to build a story! Jonathan Taylor has also published Take Me Home: Parkinson’s, My Father, Myself, and plans to publish a collection of poetry later this year entitled Musicolepsy. Did you read Entertaining Strangers, and if so, what did you think? Share your comments with us below. I loved it! Jules and the landlady are my favorite characters.